Built in 1864 on land donated by Thomas James Agar-Robartes, the owner and 1st Baron of Lanhydrock, the house was designed by George Edmund Street, an eminent architect of his day, who had strong connections with the Pre-Raphaelite brotherhood and designed the Law Courts in the Strand, London as well as Gothic style churches throughout Europe. The house, standing on a hill overlooking the town of Lostwithiel, a gun site during the Civil War, was first known as St Faith's House of Mercy. 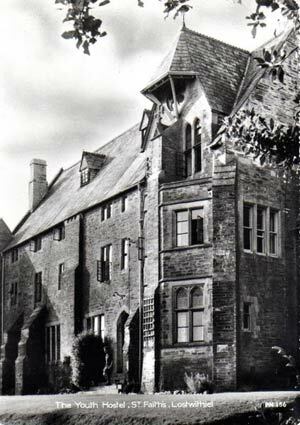 The Church of England order of nuns from St Mary's, Wantage, ran the house as a refuge for "wayward girls" who were rescued from Bodmin Jail and put to work running a laundry which served Lanhydrock Estate and the local community. The Chapel was added in 1876 and the West Wing, built in the memory of Revd. Arthur Tatham, one of the founders of the house, was added over two periods in 1875 and 1883, completing the structure as it is seen today.. In 1949, the house was purchased by the Youth Hostel Association who ran it as a hostel until 1970. The house was then purchased privately and underwent the first conversion into holiday accommodation. An ongoing programme of improvement and refurbishment by successive owners has resulted in the quality accommodation of today. Reference to St Faith's are found locally at the churches of St Winnow and St Nectan's and in The National Trust Museum at Lanhydrock.